One of my bennies when I was 10 years old was getting to stay up late on Saturday nights and watch a late show, usually on CJBC TV Toronto Channel 11. They had all of the good films, and one night the movie was “Sahara” with Humphrey Bogart and an M3 tank named Lulubelle. Lots of action and good acting made it a good film and fun, and left me wanting to build a model of that tank. When Academy announced two new kits of this pair modelers were excited, especially since they came with interiors! Alas, they brought in their own new problems even as they corrected some of the old ones. First one was bogies some 3mm too high which made the tank look like it was on tiptoes, an exaggerated cast turret on the M3 Lee, an angular turret on the Grant (which came with new bogies of the right height due to complaints), and other problems. Now Takom is releasing new kits of both tanks; on first glance it looks as if they have solved most of the problems from the first two but have added some quirky new ones of their own. Molding of this kit is nicely done, and the provision of link-and-length T51 smooth pad reversible tracks will please a lot of casual and “weekend” modelers as it solves one of the main complaints of modern kits, multipart single links taking hours to clean up and assemble. But whereas the other kits had a nearly one piece upper hull, this kit now breaks that assembly down into 12 major parts that must be precisely assembled to get a proper fit. While they all have tabs and notches, this will make some modelers feel they need four hands to ensure a clean build. Assembly starts with the lower hull as most kits. However, the idler mounts (D2/3 and E18/19) are fixed once in place so care will be needed in assembly of the tracks as no adjustment is possible as with many other US medium tank kits. Each bogie unit consists of some 19 parts (!) but they are logically assembled, have no “working” springs, and the only parts needing real care are the bolt heads that must be cut from the V sprue and cemented to the arms. The drivers are conventional two-piece affairs, but the idlers have separate rims and hubs. The nicely provided track jig is for the upper run to ensure it lays flat on the top of the return rollers but has a slight upsweep to the drivers. This is the first time I have seen this in a medium suspension kit and while subtle can be seen in photos of early M3 tanks. The assembly of the casemate and upper hull start with attaching the sides to the hull pan. This is followed by the duck-in for the inside of the gun mount area from two parts, the lower and upper glacis, and the left front hull panel. Hull doors are nicely done and consists of some five parts including viewer and handles. Each viewer has a hatch and an insert. The hull roof comes next with its stiffeners and hatch plus the hull rear; this is molded as a flat piece with cutout notches and is bent to fit by the modeler. The gun is next with an option for with or without counterweight, but as the 37mm gun has no stabilizer perhaps the latter may not be needed as to my knowledge most tanks were fitted with both gun stabilizers at one time. There is zero interior anywhere in this kit, but the gun mount does come with an articulated arm for the gunner’s sight (D18 and E15/25) and it rotates with the mount. The engine deck finishes the main upper hull and consists of the deck and two separate side panels. It comes with an etched brass screen and four small etched knobs. The kit portrays the vehicle with the early round air cleaners and no exhaust fishtails through the rear screen. Engine access doors are provided but no opening, mounting flush against the lower stern plate. Details include clear lenses for the headlights and etched brass guards, but surprisingly the siren (E4/8) has a solid styrene front vice an etched brass one as some other kits provide. There is zero interior in the turret or commander’s cupola with both of them having mounts that can rotate but have no breech assemblies. While the 37mm barrel is slide molded neither machine gun is and bores will need drilling out. 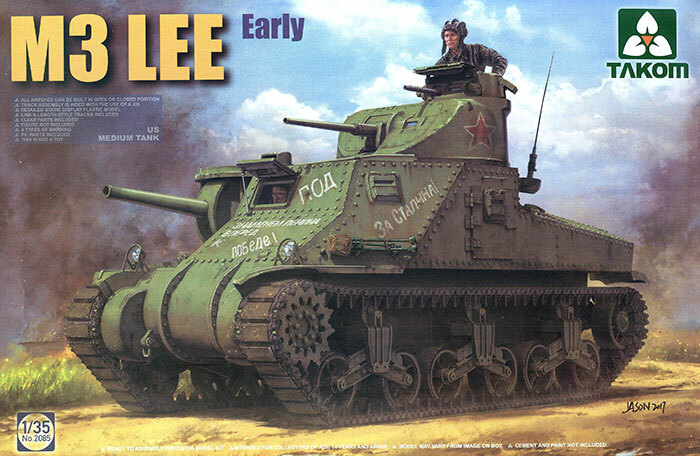 Four suggested finishing options are given, all in olive drab: M3s, Red Army, red stars and white slogans (“Carrying Lenin’s Banner FORWARD to VICTORY”, “For Stalin”); M3, US Army in the early reversed color markings, D-11. blue drab USA W. 305,797; M3, US Army, white stars, “Boomerang”, white 16, black USA W-3010,707; and M3 US Army, white stars with yellow bands, black USA W-304,287. One question many modelers have asked is - can the interior from the Academy kit fit into this kit? The answer is sure...BUT... This is not a drop fit and a lot of the parts from the Academy kit will need trimming, shaving, shimming and modification to fit into this kit. It can be done, but prepare for a lot of work and test fitting as you go. I for one intend to try this - especially since I want to do up the model as “Lulubelle”. In summary, this kit offers a lot of promise and has some nice features which in the days of thousand-part kits will endear it to modelers wanting contemporary quality but not tedious chores in building it.